X-Small - €19.99 Only 2 left! What do you do when you have to oppress the entire galaxy at 6:30 but you have a relaxed cocktail party at Tarkin’s downtown apartment at 8:15 that same night? You still have to be a dominating and terrifying villain, but you don’t have time to change, so you’re going to want to be comfortable and dressed-down. Hmmmm. The answer is obvious--this cute and stylish dress! With this I am Vader Long Sleeve Skater Dress you can still manage to look totally in charge while commanding the Imperial fleet to crush the rebels on Hoth or while torturing Han Solo on Bespin, but you’ll also feel at home at the quiet loft gathering with a beverage in your hand (whatever it is Vader that is sipping on these days). Don’t let anyone convince you otherwise; just because you are a Sith Lord does not mean you have to dress like a hulking juggernaut. In fact, it’s probably good to take off that daunting outfit every once in awhile and, light saber in hand, let your skin feel the sun and breathe some fresh, natural air. You don’t want to find yourself in thirty years, with chalk-white skin, barely able to survive for more than a few minutes without your suit doing most of the work….do you? Of course not! 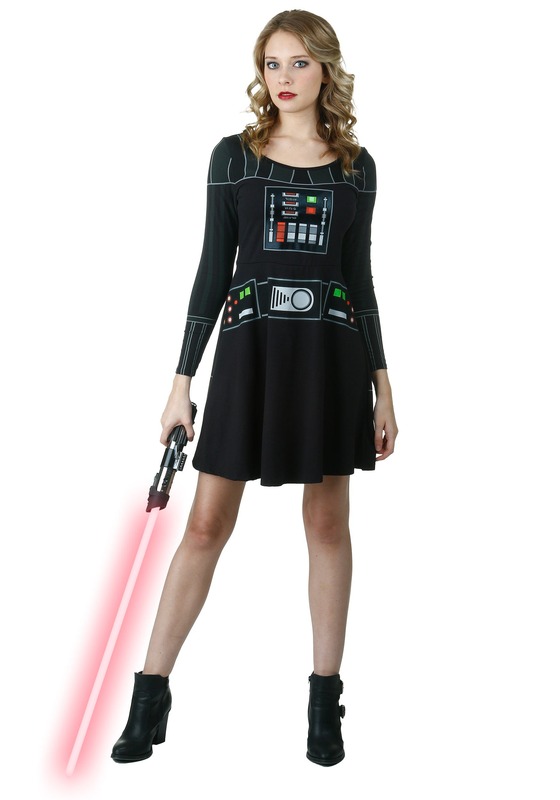 This Darth Vader printed dress lets everyone you know that you are all about keeping a firm grip on the galaxy, while also being all about having a good time in a relaxed and comfortable way. Explore your gray area; you don’t have to be either/or. Let your hair down and let yourself enjoy that night on the town. You’ve earned it after all that Death Star business.